This is your last chance to experience the 2011 Source Festival, packed full of 10-Minute Plays, Full-Length Plays, Artistic Blind Dates, and a one-night-only Talent Show. Buy your tickets here. Touchstone Gallery during the month of July as Touchstone partners with Art In Hand, to promote the work of artists here in DC. Each deck is composed of a fantastic array of genres and mediums which are a big hit with artists, school teachers, magicians, game players and art lovers everywhere. Each deck is like holding an Art Gallery right in your own hands. Washington is the third city in a series of art decks created by Art In Hand TM, an arts publisher out of Charlotte, NC. Founded by Dione Goyette in 2009, the first project united artists in the Charlotte area and then inspired a deck in Portland, Oregon. This imaginative and collaborative project isn't just fun and games. So far, participating artists in Charlotte and Portland can boast that their work is in the homes of over 3,000 and 5,000 people respectively. Decks in both cities will go back for second printings this year. Artists: Alderton, Erin Antognoli, Michael J. Auger, Jennifer Beinhacker, Chris Bishop, Jennifer Bishop, Liliane Blom, Adam Bradley, Tory Cowles, Karen Deans, Cheryl Patrice Derricotte, Devbo, Dana Ellyn, Theresa Esterlund, Susan Feller, Beth Hannon Fuller, Jenne Glover, Emily Greene Liddle, Rosemary Luckett, Sue Lynch, Susan Makara, Angela Maray, Joyce McCarten, Newton More, Jennifer O'Connell, Eileen Olson, Maggie O'Neill, Kristy Orr, Cindy Packard Richmond, Judith Peck, Pam Rogers, Daniel Francisco Roncesvalles, Lisa K. Rosenstein, Matt Sesow, Pauline A. Siple, Isabelle Spicer, Charles St. Charles, Mary Gallagher Stout, Dan Tulk, Pamela H. Viola, Gail Vollrath, Andrew Wodzianski, Emma Sky Wolf, Sharon Wolpoff and Jason Zampol. Artist and Early Childhood Educator creates acrylic paintings in the American abstraction tradition. McGee is inspired by Pablo Picasso who said, “Every child is an artist, but the problem is how to remain an artist once he grows up.” For thirty years McGee has been teaching and assisting Early Childhood teachers to find the artist within. Donna K. McGee’s work is well known in the Washington, DC area. Her award winning work has been exhibited in New York and is in public and private collections. Her surfaces initially portray calmness, but they betray the possibility of implosion, as the many facades give way to the unknown beneath. Victorian aesthetics and the modern world mashed up in a multimedia tableau; a self-contained world of double identities and make-believe friends. For PLANNING PROCESS, juror Helen Allen—formerly of PULSE art fairs; currently planning D.C.’s first-ever (e)merge art fair, opening this September—selected 12 artists from across the mid-Atlantic region who were willing to reveal the ways they think and problem-solve in the studio. Zenith Gallery officially opens a beautiful show, featuring the work of two award-winning sculptors inThe Spirit of Wood exhibition, shining a light on their mettle, musings and talent in bringing out the beauty and soul of wood. Whether using wood in its natural form or found objects constructed of wood, Katie Dell Kaufman and Lynda Smith-Bugge both create a serenity and timelessness in their art. While Katie’s work, made from existing pieces, reflects a ritualistic and ceremonial nature, be it ancient Oriental or early American, Lynda’s, crafted from rare pieces found in nature, expresses the purity and spirit of wood in its original form. Patrick Hughes, Eve Stockton, Sondra Arkin and Natasha Karpinskaia each approach their respective artistic spaces in ways not normally featured at Long View Gallery. From wood block printing to encaustics, monotypes and reverspectives, these artists are pushing the boundaries of their respective processes. Patrick Hughes’ reverspective pieces shockingly spring to life on the wall. The works approach perspective in a unique manner, elevating these static paintings to what seem like moving pictures. Hughes succeeds in creating the illusion of movement in his hallways, canyons and walls through a unique method of painting the forward most sections of his three dimensional constructions as the shadows, and the furthest back sections as the light, hence reverspectives. His sleight of the hand is astounding, allowing the walls in his work to swivel and slide depending on the viewer’s position. Eve Stockton’s multi-layered wood block prints represent a unique approach to a traditional process. Her studies in science and love of nature combine to create a contemporary and unexpected result. The scale of these works is mesmerizing, a true testament to her mastery of this art form. Sondra Arkin explores encaustics, meticulously creating works with a sense of restraint in color but excess in scale. The application and subsequent burning away of shellac creates a extraordinary amber surface full of organic forms. Through a very labor intense process, Arkin succeeds in creating unique encaustic panels, outside of the traditional ideas of this medium. Natasha Karpinskaia’s command of color elevates her abstract monotype prints above the safe and expected. Anticipated norms are often challenged with vibrant hues of pinks, greens and blues while maintaining a sense of balance and beauty. The Brentwood Arts Exchange is pleased to announce The Sky's the Limit, the 2011 Prince George's County Juried Exhibition. Photographic imagery is ubiquitous in nearly every aspect of our lives, from billboards, to cell phone videos, to keepsake albums to Facebook profiles. It's no coincidence that it is just as pervasive throughout contemporary art - even in media that are often thought of in stark contrast to traditional photography. The Sky's the Limit presents a glimpse of the ways photography employs itself throughout the visual arts, here and now. Juried by Michael Platt, the exhibition presents the best photo-inclusive art by artists who live, work, or study in Prince George's County. Hosted in the Gateway Arts District for the second time, this Prince George's County Juried Exhibition is our chance to show off the important contributions that artists in our county make to contemporary art throughout the region. Michael B. Platt Michael B. Platt is a 2007 recipient of the prestigious Franz and Virginia Bader Fund Grant. Long known as a printmaker, Platt now prefers the more encompassing designation, "imagemaker." BITE: identity and humor is Juried by video and performance artist, Jefferson Pinder. The exhibition features eighteen artists from the mid-Atlantic region whose work includes video, performance, painting, photography, and sculpture. Alan J. Simensky, Gwynneth VanLaven, and Wilmer Wilson IV. Hillyer Art Space announces a new music series, The Recorder. Bringing new music into a contemporary art setting, The Recorder hosts independent, contemporary, and experimental music performances. Hillyer Art Space believes that new music plays a critical role in a vibrant arts community, and aims to create new opportunities for music to engage with art. The Recorder provides a meeting place for the art and music worlds, allowing for new encounters between artists and musicians, and creating the opportunity and space for collaborations to occur. Cigarette is an Arlington-based band that plays well-pitched and heartfelt music. They are bringing a more than welcome appreciation for calm and grace to the local music scene. You can listen to their quiet resonance at www.myspace.com/slowmoans. Linling Lu, Theandric Idol, 2007, acrylic on linen, 72" x 76"
July 5, 2011. Submissions must be received by the CaFE website by 12 midnight. world entities, articles, gadgets, devices, objects and materials. This show will seek to explore how these relationships can be illustrated or revealed through spectacle and magic that relies on arrays, sequences, intervals, quantity, counting and numbering schemes, geometry, lines, linearity, circles, sectors, angles, measurement, mechanics, engineering, and similar notions. BY THE NUMBERS will also attempt to include connections, relationships and intersections among these concepts and the natural and environmental forms and influences evident in numerology and metaphysics. The exhibition is open to members of the Washington Sculptors Group whose 2011 membership status is current (Refer to your spring Newsletter mailing label for membership status). Artists who are not already members may join WSG by paying the annual dues of $45 ($15 for full-time students). To join please go to: http://washingtonsculptors.org and click on "Join WSG." Visit CaFE Calendar to view the application. NO LATE SEATING: All seats are general admission. There is no late seating at Fringe because it’s too disruptive for the audience and difficult for the all-volunteer box officers to manage. With only 30 minutes between performances, things run on time. 2011 Capital Fringe Festival will launch its festival schedule and ticket sales for this year’s lineup of over 100 shows at 19 venues on June 20, 2011. The area’s largest performing arts festival takes place Thurs., July 7 through Sun., July 24, 2011. This year—the festival’s sixth—about 2,000 participating performing artists participate in shows ranging from comedy to dance, from musical theatre to experimental performance art. Fringe staff expects to issue more than 30,000 tickets to the 18-day festival. The festival’s beer tent, The Baldacchino Gypsy Tent Bar, will open on June 20 for a series of pre-festival events. After seeing a show, patrons are encouraged to visit The Baldacchino Gypsy Tent Bar at Fort Fringe to share your experience and hear about other shows. This is a great opportunity to build bridges between communities and also between the artists and patrons. Capital Fringe is still in need of volunteers to host eight visiting artists for up to six nights. If you have a spare bed, a sleep sofa, or room to set up an air mattress, please consider hosting one or more of these artists; if not, please forward this request to friends, relatives, and colleagues who do. Every year, Capital Fringe welcomes dozens of out-of-town artists from cities here and abroad. As Fringe artists generally don't have funds for hotels and are truly appreciative of the volunteers who host Fringe artists. Join us for a Launch Party at the Washington Design Center's DreamHome to celebrate the publishing of the 5th edition of the WPA Artist Directory! This will be the very first opportunity to see and purchase this full-color guide to WPA member artists that serves as a reference tool for curators, gallerists, patrons and artists. 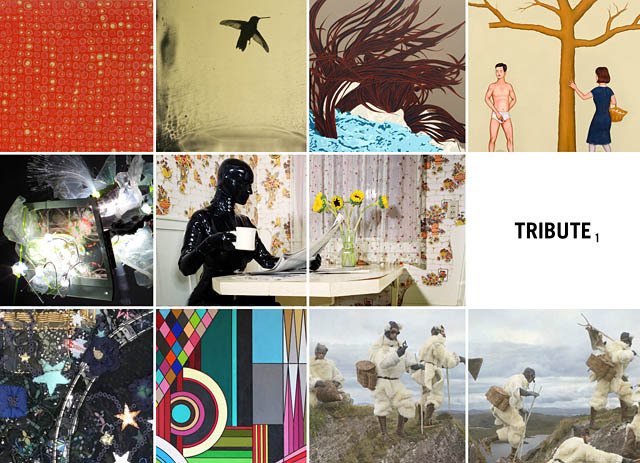 This year, the 2011-2012 Artist Directory is available for a new, lower price of $9.95 plus tax. The venue is the DreamHome located on the 5th Floor of the Washington Design Center, an extraordinary space that features work by several WPA member artists in rooms decorated by some of Washington's top interior designers. Work by Anne Marchand is featured in Andy Staszak's "Family Room" in the DreamHome. Come see. Artists and advertisers who have not previously indicated that they will take delivery of their complimentary copy of the Artist Directory by mail may pick up their copy at this event. Additional copies may also be purchased. WPA would like to thank the Washington Design Center for its generosity in sponsoring this event. The Washington Design Center is the mid-Atlantic region's largest single resource for high-end home furnishings and decor. If you have questions about this event or about the Artist Directory, please contact Membership Director, Liz Georges, via email at lgeorges[at]wpadc.org or via phone at 202-234-7103. Four large artworks by AAC resident artists Lee Gainer and Bridget Sue Lambert now deck two of Rosslyn's pedestrian walkways through August. OPEN SKY ART 2011 is a collaborative project of Rosslyn Renaissance, the Rosslyn Business Improvement District (RBID), and the Arlington Arts Center (AAC). Stop by and take a look this summer: the banners come down in August. The deadline for this year’s SOLOS call for entries is July 1. Click here for the application prospectus. This year AAC’s SOLOS 2012 competition will be juried with the guidance of three exciting guest judges: Klaus Ottman, Karen Milbourne, and J.J. McCracken. The exhibitions program at the AAC supports the work of 10 to 14 contemporary artists in the Mid-Atlantic region in SOLOS exhibitions. Submissions are reviewed by an exhibitions committee, which includes notable artists, critics, curators, and collectors. Each artist mounts a self-contained show in one of seven separate gallery spaces. In an exhibition that combines drawings and an interactive sculpture, American Temple offers Jenny Sidhu Mullins’ meditations on incarnation, Eastern spirituality and cultural appropriation. Mullins new works were inspired by a trip she took to India on a Fulbright Scholarship to research spiritual tourism. The artist riffs on the ways in which American culture has adopted and assimilated various Eastern cultural traditions and objects. More information at flashpointdc.org and jennymullins.com. Pictured: Jenny Mullins, Spiritual Accessories No 2, 2011, graphite and flocking powder on Japanese paper. 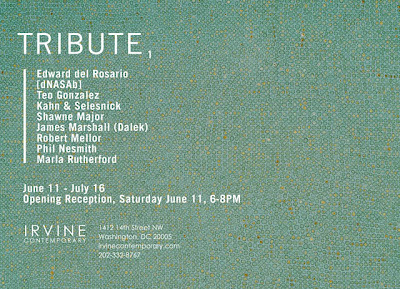 Opening Thursday, June 16, 7 - 9 pm with a reception and gallery talk. 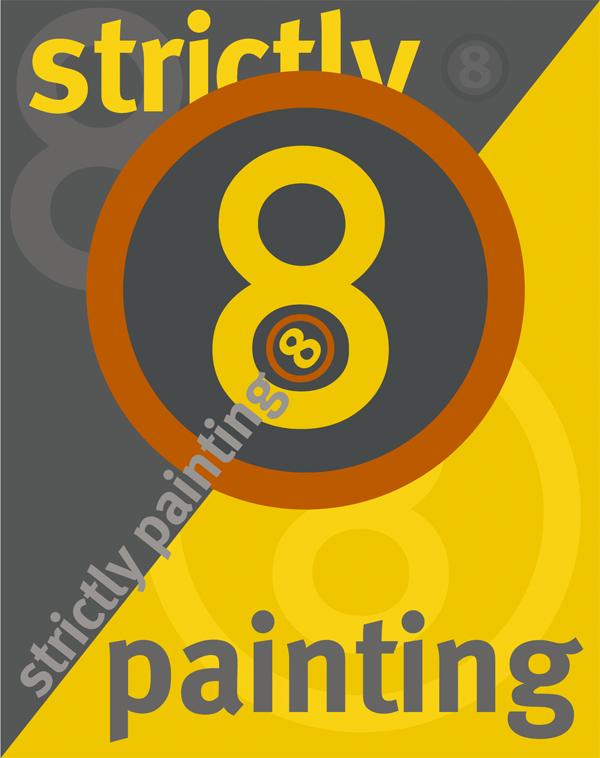 Strictly Painting 8 is on exhibit at McLean Project for the Arts through July 30. This biennial painting exhibition was juried by Jayme McLellan, founding director of Civilian Art Projects in Washington DC. Ms. McLellan selected 37 artists from almost 200 who submitted their works. Also on exhibit in the Ramp Gallery is the MPA/Corcoran Student Exhibition featuring works by students who have taken classes at McLean Project for the Arts through partnership with the Corcoran College of Art + Design. McLean Project for the Arts is located at 1234 Ingleside Avenue in McLean. 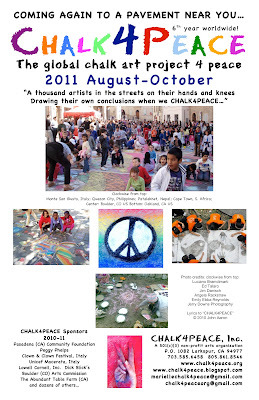 to Quezon City, CHALK4PEACE draws the world together again with expressions of peace. The title of Carlotta Hester’s Govinda Gallery show refers to the integrity of traditional Irish music, played on guitars, fiddles, accordions, flutes and – by one impure participant – a Roland synthesizer. Participate in Perfect Girls "When I was perfect"
Join Judy Byron this Sunday June 12 at 1:30 P.M. Although many years have passed since the emergence of the Feminist Movement, the Gay Rights Movement, the passage of the Civil Rights Act, and the passage of Title IX, I believe the concept of a perfect girl still resonates through our North American culture. Through the web outreach of "When I was Perfect" and the sale of Perfect Girl t-shirts, I aim to explore and claim the phrase PERFECT GIRL; transforming it into a vehicle for individual and community empowerment. Women and those who identify as female are invited to join in. All submissions grant permission to be included as part of Perfect Girls at www.judybyron.com and later in an artist book. The Rawls Museum Arts 2011 Juried show will be on view through July 11th. Congratulations to all the artists selected for inclusion. 20th Anniversary Celebration "Living Embodiments: Artistic Expressions of Being"
Gallery is open Tuesday thru Saturday from noon to 6:00 PM or by appointment. Bettmann Dances is pleased to announce the impending arrival of the company’s second main stage performance, a yearlong community exploration of security called Quis Custodiet. With three sections of the work created and performed over the last year, Bettmann Dances looks forward to the September 2nd premier of Quis at the Woolly Mammoth Theater in downtown DC. The project is created by an awarding winning artistic team including Bettmann, video creators Tim Tate and Chanan Delivuk and costume designer Ginger Carlin. The project is already benefiting from the participation of a host committee in seeking sponsors, promoters, supporters, and media partners, and from the participation of the community in company-hosted dialogues about community and national security. After a visit to his native Moscow in 1912, Wassily Kandinsky (1866–1944) sought to find a way to record the “extremely powerful impressions” that lingered in his memory. Working tirelessly through numerous drawings, watercolors, and oil studies over a five-month period, Kandinsky eventually arrived at his 1913 masterpiece, Painting with White Border. The exhibition will reunite this painting with over 12 preparatory studies from international collections, including the Phillips’s oil sketch, and compare it with other closely related works. Complemented by an in-depth conservation study of Painting with White Border, the exhibition will provide viewers with a rare glimpse into Kandinsky’s creative process. This exhibition is co-organized by The Phillips Collection and The Solomon R. Guggenheim Foundation. For the first time in a museum exhibition, The Phillips Collection presents recent works from Frank Stella's Scarlatti Kirkpatrick Series inspired by 18th-century composer Domenico Scarlatti's harpsichord sonatas. Made from lightweight resin, the swirling multicolored polychrome forms with coiled steel tubing armatures are dynamic evocations of the colorful sounds and rhythms of Scarlatti's music. Traveling through space, the sculptures perform like objects on a stage. Each one begins as a hand-crafted model that is scanned into a computer, where Stella refines the design before realizing it at full-scale. Moving at the crossroads of painting, drawing, and sculpture, Stella's Scarlatti K series ushers in a bold new chapter in the artist's exceptional five-decade career. June 11, 2011, 10 a.m - 5 p.m. In conjunction with "Kandinsky and the Harmony of Silence: Painting with White Border" and on the occasion of the centennial anniversary of Kandinsky's seminal treatise, Concerning the Spiritual in Art, Frank Stella and leading artists, conservators, and scholars reconsider Kandinsky’s contribution to modern art and his lasting legacy on the art of today. Panelists discuss Kandinsky’s painting methods and techniques, the historical context in which he worked, and how his art and ideas resonate in contemporary art. The Phillips Collection is located at 1600 21st Street, NW, Washington, D.C., near the corner of 21st and Q Streets, NW. To visit the Phillips using Metrorail, take the Red Line to the Dupont Circle station. Make sure to use the Q Street exit from the station to avoid several minutes of extra walking. At the top of the escalator, go left (west) on Q Street to 21st Street, NW. The museum is located at 1600 21st Street, in the first block to the right from Q Street. The Phillips is also accessible via several Metrobus lines. Organized by the Alliance Française; the Chinatown Community Cultural Center; the DC Shorts Film Festival; the Goethe-Institut Washington; Istituto Italiano di Cultura, Embassy of Italy; the Japan Information and Culture Center, Embassy of Japan; the Korean Embassy’s KORUS House; the Embassy of Spain; and the Royal Thai Embassy. Featuring award-winning works from the most recent annual German graduate photography competition. The Bethesda Art Walk and tours return Friday, June 10 from 6-9pm. Free guided tours start at the Bethesda Metro at 6:30pm. The Art Walk features 11 galleries and businesses that open their doors the second Friday of every month to showcase original artwork. Enjoy the opportunity to browse the work of internationally acclaimed photographers, winning painters, local ceramic artists and so much more. "Cuttings From a Winter Garden"
Saturday, June 11, 1-4 pm Woodcuts, drawings, and pastels. Studio H celebrates the groundbreaking work of Ecuadorian artist Pablo Caviedes. This is your last chance to see the entire Mannequin series exhbited in the same space. Here is more about the exhibition in the artist's words:"As a Latin American artist I feel that speaking about our art is like connecting with the fable, the myth, and the constant metamorphosis of this fascinating culture. One that arises as a result of a great encounter that began five centuries ago between the old continent, the Western world, and our millenarian American indigenes. Tapestry artist Susan Klebanoff will talk about the evolution of her unique and original process of creating multi-layered artwork, and will unveil several new tapestries in a surprising new format! June 2 through June 30. These works are authentic to the stage of life that I am living right now. They express both my artistic ideals and my daily experiences of being part of a growing family. I have always found my life as an artist and my life as a wife and mother to be two sides of the same coin. In this same way, the artworks in this series should be totally integrated -- formally and conceptually. This intersection of form and concept is a truth I try to expose in all of my work. Through color, value, rhythm, mark and direction these works express a sense of humor about life. I love to find the absurdity in the serious, the chaos in the order, and authentic beauty in unexpected places. Toys are a light-hearted vehicle for expressing the serious issues of life. They also communicate a "process of becoming". Good art comes from life lived. I never want my art to be a closed program of personal indulgence. Rather, if I achieve my goal, each work's tenor will resonate with viewers in a personal way. The work should continue to evolve in a viewer's eye long after the first glance. Washington Sculptors Group is pleased to announce Sculpture 1275: Jack Biesek, the fourteenth in a series of ongoing exhibitions presented in partnership with Axent Realty. The 2011 Sculpture 1275 exhibition series was curated by Washington artist Lou Stovall. Jack Biesek has more than thirty years experience as an artist, designer and sculptor. His current work includes enduring sculptures that explore icons and archetypal symbology. Biesek works with a variety of classic materials including bronze, steel, gold leaf, marble and granite. His elegant finishes and unique patinas reflect classic styles handled in a contemporary and fresh manner. Biesek lives and works in San Luis Obispo, California. Visit www.californiarustic.com for more information. Selected works in this show are fabricated from HDU (high density urethane) coated with aqua resin and pigment. This material is used to create sculptural shapes prior to being cast in bronze. All works in the exhibition are available in cast bronze or as originals in HDU (as noted). Join The 9/11 Arts Project!! Join The 9/11 Arts Project - Add your event to the citywide healing discourse or submit to the Art Bank! The 9/11 Arts Project, initiated by Smith Farm Center for Healing and the Arts, is a yearlong, multi-venue arts collaboration and citywide discourse around the 10-year anniversary of September 11. The project will provide the opportunity for art spaces, non-profits, theaters, social activist groups, and artist collectives to engage in the conversation and connect with the greater Washington DC community. Organizations are invited to submit an exhibit, performance, or other event to be included in the project. And, for individual artists looking to get involved, submit to the Art Bank! Learn more at 911artsproject.com. Smith Farm Center for Healing and the Arts is a non-denominational, non-profit 501(c)(3)organization based in Washington, DC. We welcome people of all races, genders and religious traditions. Smith Farm Center offers partial scholarship assistance for our programs whenever possible. June 10th through June 30, 2011. 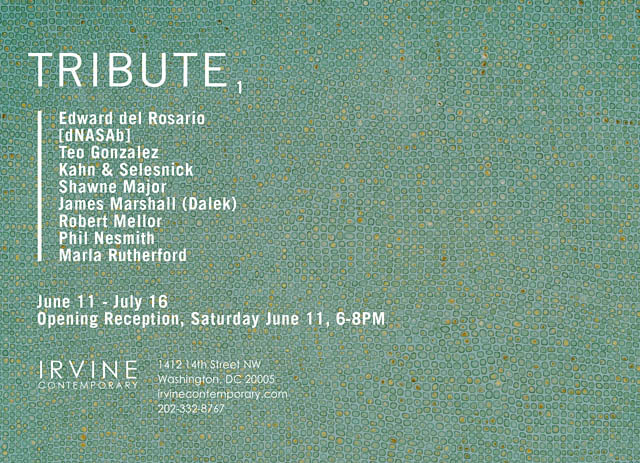 Opening Reception: Friday, June 10th from 6-9 pm. 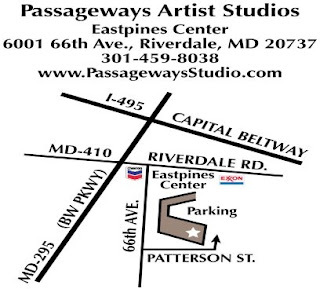 The opening reception is during the Bethesda Art Walk on Friday, June 10th from 6 to 9 pm. Seven of the artist’s giclee prints, including a limited edition of her signature painting, “Butterflies are Free” and drawings will be on exhibit. DeBerardinis is an established artist in the D.C. area, a Working Artist for Golden Artist Colors, former Bethesda Art Tour Guide, winner of the Liquitex Award, contributor to D.C. Art News and a Resident Artist with Zenith Community Arts Foundation. She is known for her large abstract expressionist paintings exhibited in museums and commercial galleries internationally, which will be on exhibit at the Ratner Museum in Bethesda, Maryland in 2013. She is a featured in the recent publication 100 DC Artists by F. Lennox Campello, critic, artist, curator and co-founder of the now closed Fraser Gallery. Concurrently, she will be exhibiting prints in “Cloud 9”, June 9th through Aug. 5th at Visual Art Studio in Richmond, VA.
Gallery Hours: M-Thurs: 10-5 pm and Fri:10-4 pm. Porter Contemporary, formerly Raandesk Gallery, has a new location at 548 West 28th Street, in a beautiful space on the third floor. The building houses many galleries in a neighborhood within the artistic community of New York City. 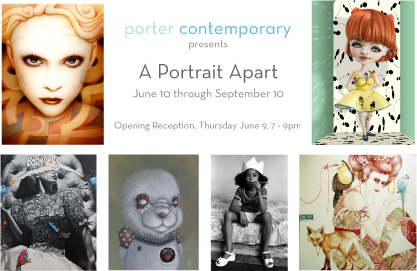 Director Jessica Porter of Porter Contemporary will open the first show in the new gallery with the exhibition A Portrait Apart, which encompasses the essence of what portraiture means today through the works of international artists Jason Bryant, Jessica Charlotte, Louise Daddona, Naoto Hattori, Jeff Huntington, Jee Hwang, Lynn Gilbert, Sarah Kaufman, Niklas Klotz, JME Pool, Laura Salierno, Anne Smerdon, Nolwenn Stephan, Ricardo Yamamoto and Saul Zanolari. The opening reception and the launch of the new gallery is Thursday, June 9 from 7 - 9 PM. Please visit the website, which is a work in progress, at www.portercontemporary.com. Competition is open for entry now thru September 1st 2011. Sean Scully: Works on Paper is on exhibit until 24th June at the Luther W. Brady Art Gallery, The George Washington University. The exhibit comprises 27 works in watercolor, drawing, and pastel from the artist's own collection and several privately owned works. It is free to the public and is open Tuesdays to Fridays, 10am to 5pm . Further information is available from www.gwu.edu/~bradyart. Saturday June 25, 3pm: Ernesto Santalla, AIA, LEED AP, Studio Santalla Inc. Veteran printmaker and world traveler Ann Zahn creates intricate linoleum cuts and lithographs full of depth and vibrancy that serve as a visual record of her life experiences. These prints evoke all of the senses – not just the visual. Using deeply personal symbols and expressive colors, Zahn’s prints preserve the memories that, like the force of gravity, “keep us grounded.” A solo exhibition of these works will be featured in The Art League Gallery, June 9 – July 5, 2011. Zahn meets the very physical process of printmaking head-on. She carries linoleum blocks with her around the world so she can sketch on-site. Each block is cut, inked, and pressed by hand. She sometimes creates collages from various prints, layering pieces to create an intricate web of color and line. As a printmaker with over 30 years of experience, Zahn can work with ten or eleven blocks to create a single print. The result is a composition with incredible depth. In the Flesh 3 returns after popular demand; this is an exhibition that examines contemporary figurative art. An all media exhibit that invites artists nationally and internationally to submit work for consideration that includes the human figure as its subject. 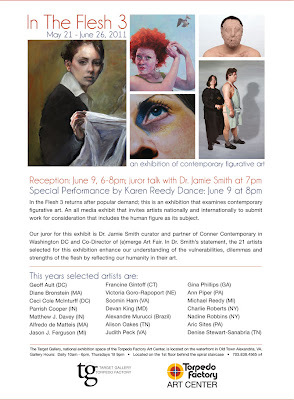 Our juror for this exhibit is Dr. Jamie Smith curator and partner of Conner Contemporary in Washington DC and Co-Director of (e)merge Art Fair. In Dr. Smith’s statement, the 21 artists selected for this exhibition enhance our understanding of the vulnerabilities, dilemmas and strengths of the flesh by reflecting our humanity in their art. Specialty appetizers and a complimentary glass of premium wine are generously provided by the Hyatt. After the reception, guests are invited to stay for a meal of innovative cuisine. (http://dkmuseums.com/ . Free entry at all participating museums! celebrate the memory of a loved one in a creative and artful way at the National Museum of American Jewish Military History (open Sunday only).Unplug the Ipod and GameBoy and try out a board game from the 1920's at Wilson House. Refreshments will be available for sale via several of D.C.'s beloved food trucks throughout the neighborhood, including Sweet Green and Carmen's Ice. **Please note that not all museums will be open both days. Event held rain or shine. Participating: Anderson House, Fondo Del Sol Visual Arts Center, General Federation of Women's Clubs, Mary McLeod Bethune Council House, Meridian International Center, The National Museum of American Jewish Military History (open Sunday only), The Phillips Collection, The Textile Museum, and the Woodrow Wilson House. Check the full event schedule at http://www.dkmuseums.com/walk.html Free shuttles between museums for those who are not in the mood to walk! Silver Spring – Washington-bred comedian Aparna Nancherla returns from Los Angeles to headline two June 4th shows of unprecedented local comedic strength. Nancherla, who grew up in Northern Virginia and launched her comedy career at clubs in and around Washington, moved to Los Angeles last year to make comedy her full-time job. Her local success and decision to relocate were chronicled last year in a major feature story in the Washington Post. The one-night performances at Vicino’s Downstairs in Silver Spring, at 7:30 p.m. and 9:30 p.m., open with Washingtonian Michael Foody, an edgy young voice familiar in clubs throughout the region. Tickets to this inaugural Improbable Comedy event are $15 with a two-item minimum purchased from Vicino’s bar, which offers beer, wine and sangria, and a full dinner menu. Vicino’s is located at 959 Sligo Ave. in Silver Spring. The show is for patrons 21 and older. 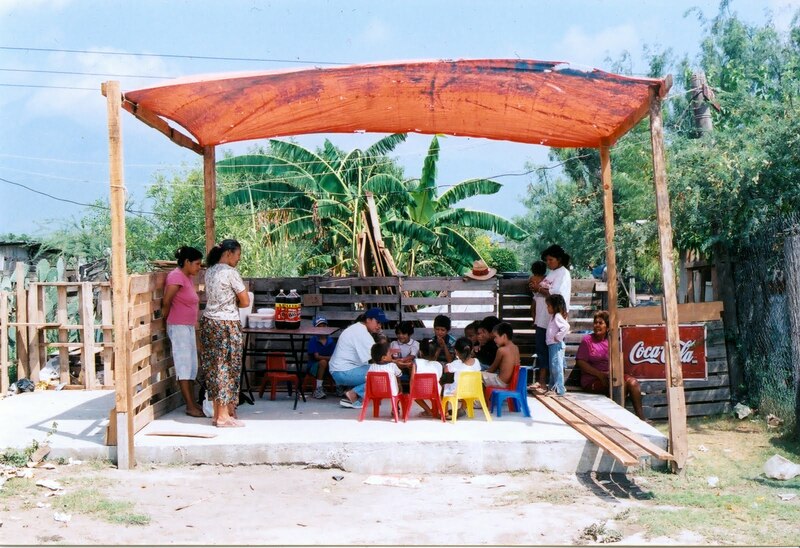 Proceeds from the June 4th shows benefit FINCA International, the Foundation for International Community Assistance, which provides financial services to the world’s lowest-income entrepreneurs. Solo exhibition by Max-Karl Winkler, Woodcuts, drawings, and pastels. On Drawing is a panel discussion that focuses on the diverse nature of the drawing practice, from graphite-on-paper, to site-specific installations, to drawing in space with non-traditional materials. Artists Julie Benoit, Leah Cooper, Elena Volkova, and Renee van der Stelt will discuss their approaches to drawing, as well as explore investigations and questions that arise in each artist's work and how that relates to contemporary drawing practices. The deadline date for online applications has been changed from September 16 to September 18. The 2012 Smithsonian Craft Show is now open for business and Co-chairs Anne-Lise Auclair-Jones and Ann Peel invite all eligible candidates to apply for this 30th Anniversary celebration of American craft. As in the past, the exhibitors will be selected by a jury of three highly qualified independent experts. The Smithsonian Women's Committee asks the jurors to identify the most accomplished artists in their respective media, whose work is innovative, well conceived and expertly executed. The jury is asked to strive for a show that is well balanced among the various media. All qualified candidates are considered equally. For the first time, Craft Show applicants are being given the opportunity to highlight their use of materials that are green, recycled, reclaimed and repurposed by applying for the Mixed Media category or by mentioning their use of such materials in their artists' statements for any category. What's Hot and Kool at the Katzen AU! Odessa, Untitled. France. 36.28 x 23.62 inches. Courtesy E•CO @ the Katzen. Want to travel, but it's too hot? Concerned about global warming and the environment? Check out the oh so cool American University Museum at the Katzen, three floors of state of the art exhibition spaces. A sneak preview of the upcoming exhibitions reveals galleries filled with art from different countries that deal with the language of art and the environment. You can explore how artists present environmentally focused art in large digital images that create both breathtaking and heartbreaking vistas. The three exhibitions on view include paintings, drawings, video, digital animation and on the 3rd floor, Sam Gilliam's liberated canvases hanging in splendid 3-d abstractions! It's an inspired mix of painting, digital and sculptural installations that deal with a hot topic. June 4, 6:00 – 9:00 PM, All three exhibitions close Sunday, August 14 so make plans to see them! Public sculpture in the urban outskirts of Monterrey, 2003. Three channels video. Video Still. Artist´s Collection. Courtesy Registro 02, Mirar por segunda vez @ the Katzen. In Registro 02, Mirar por segunda vez, you can see over fifty works by four outstanding young Mexican artists: Adrián Procel, Oswaldo Ruiz, Ramiro Martínez Plasencia, Rubén Gutiérrez—and the collective, Tercerunquinto. Is a work of art defined by the artist’s intent and methods, or do the people viewing it help define the work through their perceptions of it? Registro 02, Mirar por segunda vez sets out to show that both the artist’s process and the audience’s perception help inform art’s meaning. The exhibition includes paintings, drawings, video, and digital animation. All of the artists live in or near the Mexican city of Monterrey. Curated by Jorge Contreras, Registro 02, Mirar por segunda vez, was originally assembled by the Museum of Contemporary Art in Monterrey (MARCO), one of the leading cultural institutions in Latin America devoted to promoting international contemporary art. The exhibition’s showing at the American University Museum is cohosted by the Mexican Cultural Institute in Washington, D.C.
Nòmada, Untitled. Costa Rica. 35.43 x 23.62 inches. Courtesy E•CO @ the Katzen. River degradation. Torrential rains in Brazil. The consequences of nuclear power in Eastern Europe. All environmental issues captured through the lenses of Ibero American and European professional photographers in the exhibition photographic projects E • CO at the American University Museum at the Katzen Arts Center beginning Saturday, June 4. Each collective has a different take on what “environment” means and how to present it. A Mexican collective focuses on a “rainmaker” (a man in Mexico who survived a lighting strike as a child and believes according to pre-Hispanic tradition that he has the ability to talk to nature and ask that water sprinkle his crops). A Portuguese collective uses images of mounted and stuffed animals (taxidermy) to focus on the loss of biodiversity in Portugal. A Spanish collective’s work shows how the cost of responsibly disposing of electronic waste has led to uncontrolled contamination of third-world nations. E CO presents photographic projects by twenty Latin American and European photographic collectives, each tasked with crafting a visual essay about one of the most important topics of our day: the environment. Free of curatorial influence, the collectives define "environment" for themselves and maintain their own production and editing processes. The resulting essays reflect the interests and concerns of each group and nation, as well as the working organization of each collective. A panel discussion by photographers Latã Cannabrava (Brazil) and Sergi Camara (Spain) begins at 5 p.m. on Saturday, June 4th and will be followed by the public opening of the exhibit at 6 p.m.
Sam Gilliam: Close to Trees remains open on the museum’s third floor through August 14. The American University Museum at the Katzen building itself is worth a look and the comfort zone is just right for these hot days. It features art that explores social, cultural, and political issues—both domestic and abroad. There is parking underneath the building. PARK inside the Katzen Arts Center, 4400 Massachusetts Ave. Metered: 8:00–5:00 weekdays Free: weekends/holidays & weekdays after 5:00 pm. 4400 Massachusetts Avenue, NW, Washington, DC 20016.